A draft copy of the October 2013 timetable was leaked to the Sydney Morning Herald last Friday, all 800 pages of it. This is not the final timetable, though any changes are expected to be minor tweaks rather than dramatic overhauls. Previous expectations that this timetable would see a complete revamp of the network, removing direct CBD access for some stations, have been misplaced. 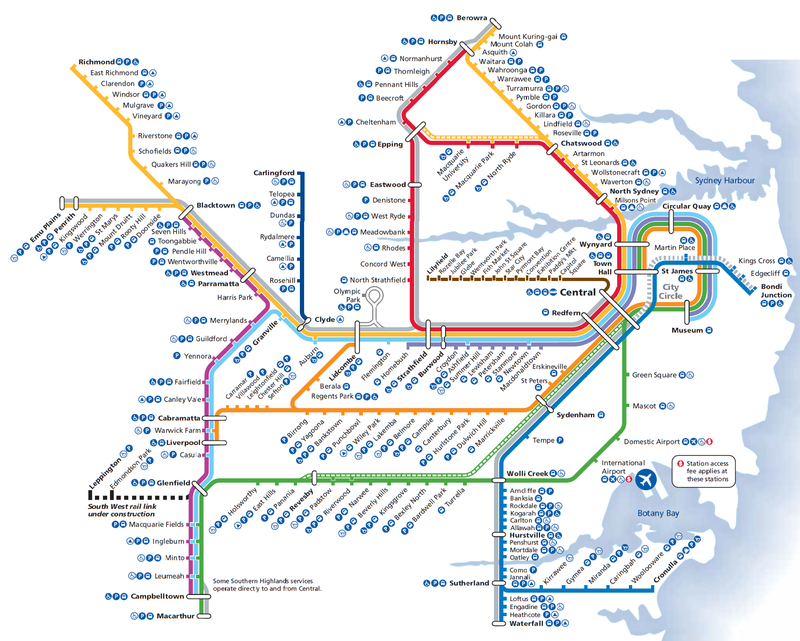 Instead, this timetable would add around 700 new weekly services (which helps to bring Cityrail closer to its pre-2005 service levels, when 1,350 weekly services were cut in order to get the trains to run on time). Not only does it add new services, but it also increases speeds, generally by the creation of additional express services that skip more stations. For certain outer suburban stations, this could mean a one way trip that is 10 minutes shorter. The other significant change is a simplification of the network and stopping patterns. This has meant taking out some of the flexibility that the current timetable has, so some journeys that can currently be made on a single train will necessitate at least one change of train. (The most elaborate is probably for a trip from Sefton to Homebush, a journey that can currently be accomplished on 1 train but will require up to 4 under the new timetable.) This may help to spread crowds out across different trains during peak hour, reducing the amount of delays caused by increased dwell times in the CBD as passengers take longer to board and disembark packed trains. Despite some minor inconveniences (which affect very few trips), these changes will improve reliability, as complexity makes it more likely for things to go wrong. One specific improvement is more harmonised stopping patterns, which will be more likely to follow clock face patterns. For example, the Illawarra Line will have only 5 stopping patterns, compared to the 8 stopping patterns it currently has. Meanwhile, trains will arrive at Arncliffe Station at the evenly spaced out times of 7:53AM, 8:03AM, 8:13AM, 8:23AM, etc, whereas they currently do so at the erratic times of 7:51AM, 8:07AM, 8:22AM, 8:35AM. The former (harmonised stopping patterns) makes the latter possible, and together they will make the rail network more of a turn up and go style system, rather than one in which the timetable needs to be checked before making a trip. This will also apply during the off-peak. An all day Cumberland Line, with trains running every half hour between Campbelltown and Blacktown. The removal of Bankstown and Inner West Line trains between Lidcombe and Homebush now that turnback platforms at these stations are complete. This will ease the strain on the rail corridor between these stations, which is fed by 6 tracks on either side despite only having 4 tracks between Lidcombe and Homebush. Incorporation of the Kingsgrove to Revesby Quadruplication into the timetable, allowing more trains from Southwest Sydney to run express into the CBD and overtake all stop services between Revesby and Wolli Creek. Additional trains from the CBD running to Macquarie Park during the AM peak (and then in the other direction in the PM peak), reducing the gaps between services from the current 15 minutes down to a more reasonable 5-10 minutes. Additional services during the AM peak on the Northern and Bankstown Lines, which suffer from the worst overcrowding problems across the network. Additional services in the off-peak for the Western and Northern Lines, allowing many of the stations on these lines to provide frequencies of 15 minutes, compared to the existing 30 minute frequencies. The timetable has not separated the Western and South Lines between Granville and Homebush, and these two lines still share track between these stations. In addition, the re-introduction of all day Cumberland Line services means trains between Sector 2 (South/Cumberland Line) and Sector 3 (Western Line) will share even more track than before, albeit on outer suburban portions of the network where this is less likely to cause disruptions to spillover onto other lines. Despite this, the removal of Inner West and Bankstown Line services between Lidcombe and Homebush should see these two sectors run more independently, despite the fact that they continue to share track. Stay tuned for more specifics over the coming days, split out into AM peak, off-peak, and PM peak. Thanks for these details. There was not much detail in the SMH report so this and future summaries are appreciated. I was looking at the Western Sydney Timetable – looks like nothing much improved. The 7.02 train has now moved to 7.06 delayed so how will computers accomodate and there seems no additional express train in the morning. Looks like Western area has been overlooked again!! I have not even bothered to look at how else we are getting done over by this timetable, this was enough to make me realise that because we are outside of a primary voting area we get nothing yet again. Wind the clock back years ago and Engadine station had to be half funded by the residents – doesn’t seem like much has changed really does it! It’s true that headways will rise from around 15 minutes between trains (with the current 4 trains per hour) to 20 minutes (with the planned 3 trains per hour) during the morning peak. But this 5 minute increase in wait times has been almost entirely offset by a 4 minute decrease in journey times into Central. And the simplified stopping patterns will improve reliability. So a train is less likely to run late under the new timetable. T5-Cumberland Line-Extra 2 services per hour for the weekends from Schofields to Campbelltown, stopping all stations, operating as the same times with the weekday timetable (07:00-19:00).